Mommy Can't Dance: What is POTS? 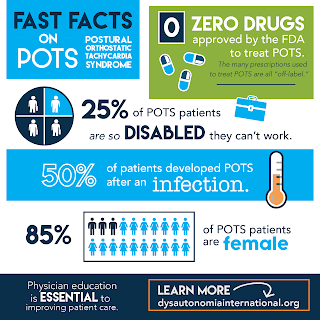 POTS stands for Postural Orthostatic Tachycardia Syndrome- which basically means a fast heartbeat when standing up. But POTS is so much more than just a fast heart rate. Just a like a fever is often a symptom of infection, tachycardia is just a symptom of a much larger problem. 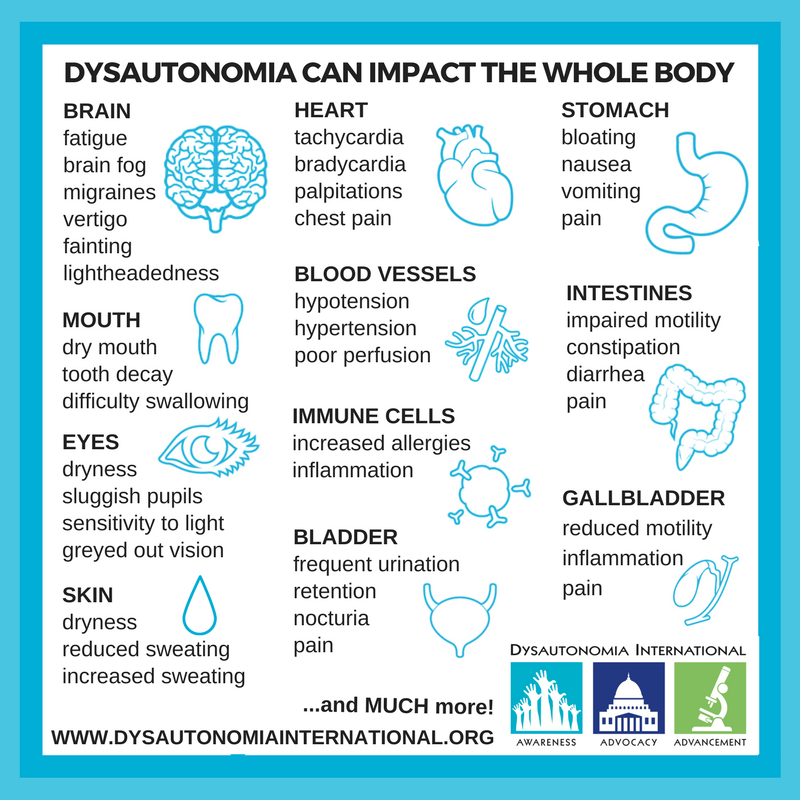 POTS is a form of Dysautonomia-- or a dysregulation of the autonomic nervous system. The autonomic nervous system controls all of the automatic responses and processes in the body-- such as heart rate, breathing, circulation, digestion, temperature control, and more. POTS itself is not a disease, but a syndrome made up of a group of symptoms. 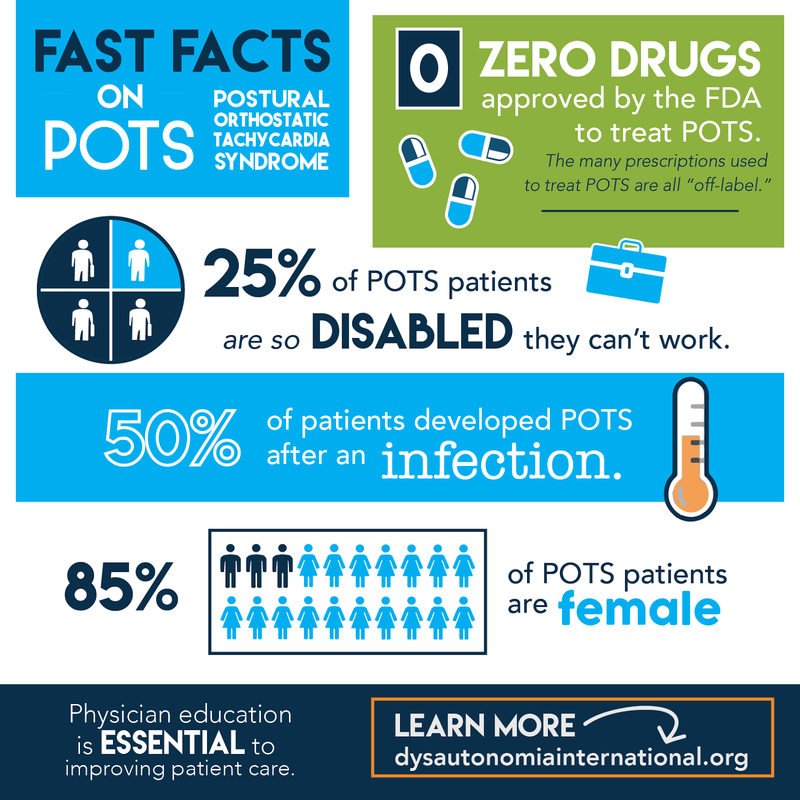 What is POTS? 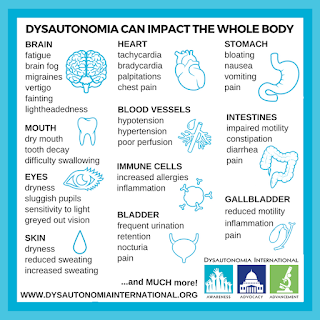 from Dysautonomia International on Vimeo. POTS diagnosis is determined by a change in heart rate from laying to standing of >30 BPM for adults or >40 BPM for teens. THERE IS NO CURE FOR POTS! POTS can be triggered by a trauma, surgery, or viral infection in which the body responds to the trauma, but when the event is over the autonomic system never "resets". *The term "exercise" is used loosely here. Many POTS patients are exercise intolerant. However, mild to moderate exercise can help, especially exercises that strengthen the leg muscles to increase blood flow and venous return. Often times exercise has to be done in laying or sitting position, as vigorous or upright exercise can make symptoms worse. Sadly, lack of exercise can also make POTS worse from de-conditioning. It's a vicious catch 22!